NASA has awarded prototypes of its R5 humanoid robot to researchers at the Massachusetts Institute of Technology (MIT) in Cambridge, MA, and Northeastern University in Boston, MA, for advanced research and development work. 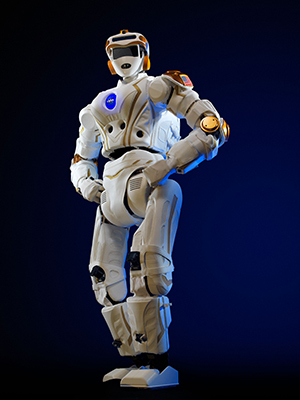 The R5 is a six-foot, 290-pound humanoid robot known as "Valkyrie" that NASA designed for use in future space missions. The R5 could potentially serve on Mars in preparation for a manned mission to the planet or as an assistant to human crew members. The teams from MIT and Northeastern University were "chosen through a competitive selection process from groups entered in the Defense Advanced Research Projects Agency (DARPA) Robotics Challenge," according to a news release from NASA. In addition to the R5 prototype, the teams will also receive up to $250,000 per year for two years from NASA's Space Technology Mission Directive (STMD), as well as access to on site and virtual technical support from NASA. The team from MIT's Computer Science and Artificial Intelligence Laboratory (CSAIL) was selected for its proposal, "Robust Autonomy for Extreme Space Environments: Hosting R5 at MIT," led by principal investigator Russ Tedrake, and will use the prototype to develop algorithms for the robot. The team at Northeastern University was selected for its proposal, "Accessible Testing on Humanoid-Robot-R5 and Evaluation of NASA Administered (ATHENA) Space Robotics Challenge," led by principal investigator Taskin Padir. The principal investigators in both projects "will serve as critical partners in NASA's upcoming Space Robotics Challenge," according to information from NASA. The Space Robotics Challenge aims "to create better software for dexterous humanoid robots used in space missions, giving them more autonomy." The Space Robotics Challenge involves a virtual competition using robotic simulations and a physical competition. The two upgraded R5 robots will be used in the physical competition of the challenge.